1. 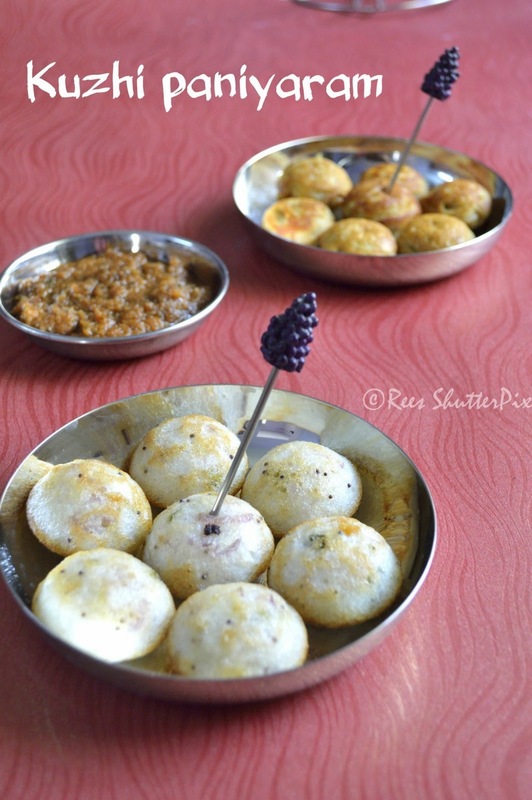 Soak raw rice and idli rice for 8 hours maximum. Soak fenugreek seeds separately for 8 hours maximum. 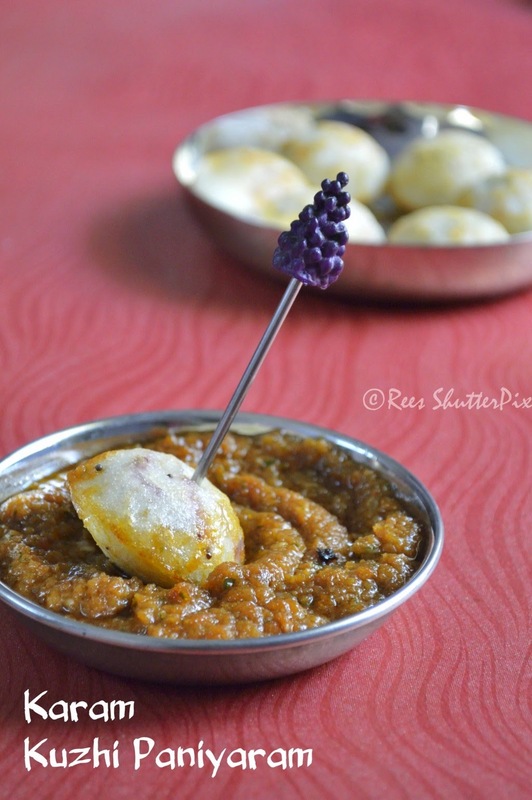 Soak urad dhal separately for 1 hour maximum. Soak poha for 5 minutes maximum. Drain the water and set aside. Grind urad dhal, fenugreek, poha for 15 minutes with very little water to a thick batter. Remove them to a vessel. 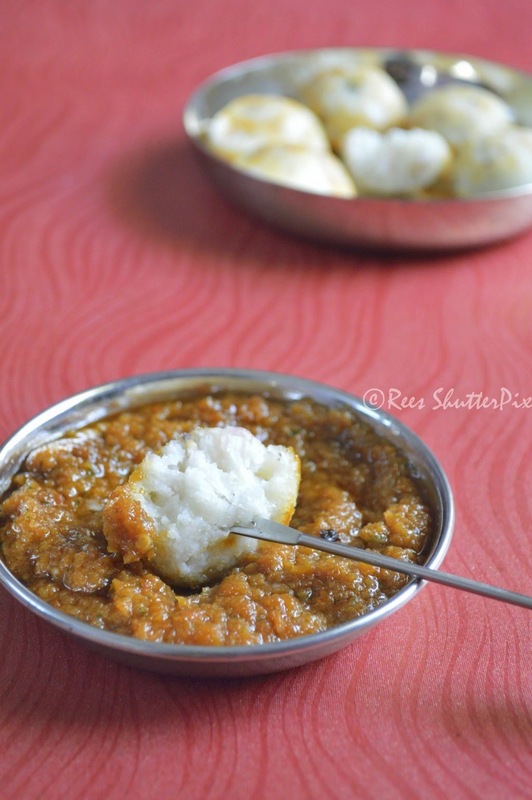 Add the raw rice and idli rice to the grinder / mixie and grind to a thick smooth batter with very little water possible. Add the urad dhal batter to the rice batter and pulse it once. Transfer the batter to a container. Fill only half the container and allow to ferment for 5-8 hours maximum. It rises well and the batter is ready. 2. In a mixing bowl, add the required batter and dilute with required water. Add salt and mix well. 3. Heat oil in a pan, add the items under temper and saute well. 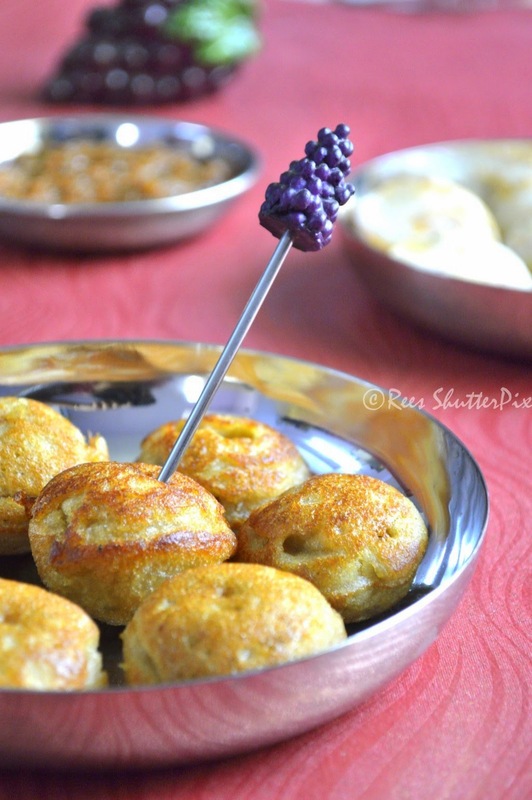 Add this to the savoury paniyaram batter. Mix well. 4. Heat paniyaram pan, add few drops of oil in each hole. Fill each hole with 3/4th of batter and cook in low heat for few minutes. As it cooks, the batter slightly arises in the center and small holes start to appear. Now, flip the paniyaram to the other side and cook for few minutes til it turns golden and crispy outer. 5. In a pan, heat water and add jaggery to it. Let it bubble and dissolve completely. 6. Strain through the jaggery water to remove impurities. In a mixing bowl, take the paniyaram batter required and add the thick jaggery water. Adjust to suit the sweetness required in the batter. Add grated coconut and mix well. 7. 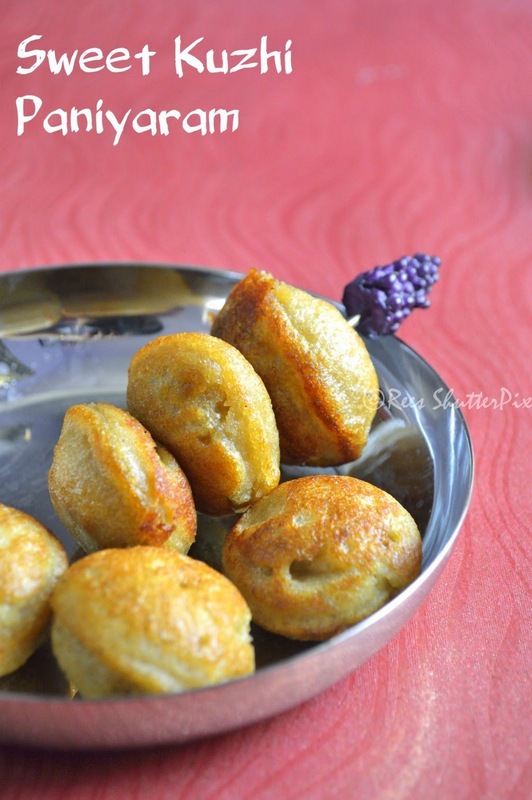 Heat paniyaram pan, add few drops of oil in each hole. Fill each hole with 3/4th of batter and cook in low heat for few minutes. As it cooks, the batter slightly arises in the center and small holes start to appear. 8. Now, flip the paniyaram to the other side and cook for few minutes til it turns golden and crispy outer. For sweet paniyaram, the batter has to be thick as we add jaggery water which will dilute the batter to the required consistency. 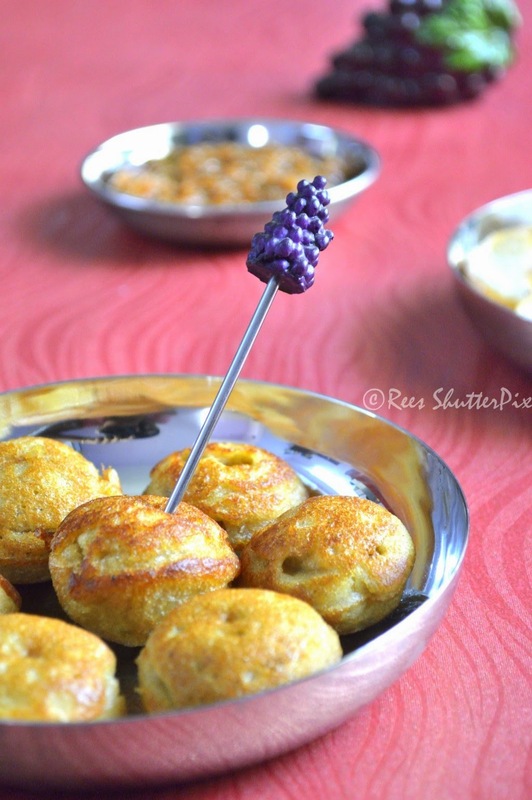 For making savoury kuzhi paniyaram, dosa batter can also be used. Check the consistency of sweet from the picture (6). It should be slightly thick and runny like spicy version. 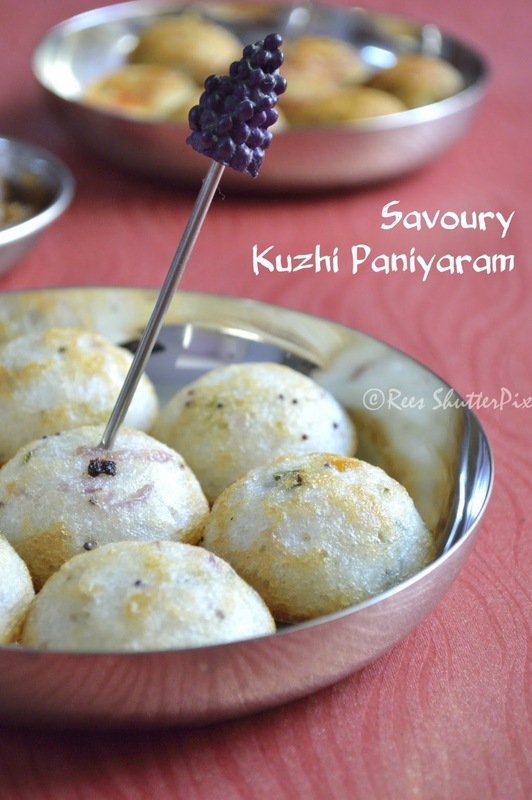 Serving Suggestion: Savoury paniyaram tastes good with red chilli chutney and coconut chutney. OMG! Paniyaaram! My favorite dish. Thank you so much for sharing it. I must appreciate your intricate details that you have shared about the making. Excellent! Thanks Gowthama...Do try and share your feedback! 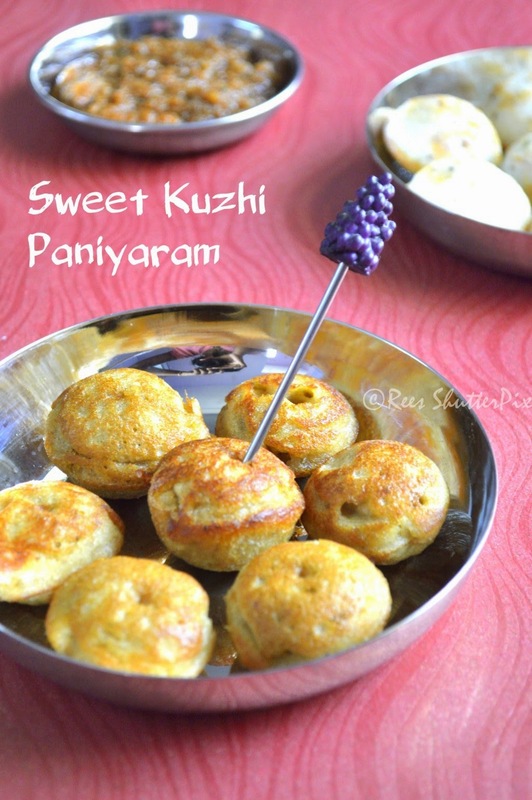 Kuzhi paniyaram looks delicious very nice clicks.